What: A small writing retreat focused on time for you to write. In addition, interact with exercises in workshops that are focused on personal sensory experiences of Italy. The exercises guide you in techniques of expressive writing and enhance all genres of fiction and memoir writing as well as personal essays and creative journaling. Simple yet powerful exercises from the Write It Out program have helped thousands of writers discover insights, connections and understanding that are valuable for their own personal growth. Suggestions for publishing and the art of query letters, pitch and platform are offered. Early evening salons provide entertainment and an opportunity to share creative work. Private appointments are scheduled for editorial consultations. The first meeting will be in the evening for introductions and arranged times for workshops and private consultations. Mornings are usually devoted to Write It Out expressive writing and sometimes expressive art exercises. Students are free in the afternoon to write or sightsee. Evening salons precede dinner and are a chance to share work. The retreat ends on the morning of the last day. Where: This retreat has been held for a number of years at the gracious Villa Le Barone hotel, once a private home and Tuscan farm and now a four star hotel, that is filled with art owned by descendants of the original Della Robbia family. As writers we use the pen to describe what we see, hear, taste, feel and smell, just as artists paint landscapes and people. You will find your own secluded places to write at outdoor nooks, a lounge beside the pool or in comfortable parlors. The hotel is situated above the village of Panzano with Etruscan roots and in the heart of the chianti classico region. A few steps from the Villa is the 10th century church of San Leolino where Sunday services are held amid 13th century art and sculpture. The village is within walking distance or a short car drive away winding down the mountain roads where one can visit the famous butcher shop and hear the owner recite Dante. The Villa is located about an hour from Florence, Siena and San Gimignano and fifteen minutes by car from Greve in Chianti. Optional sightseeing trips can be arranged. Living at a gracious villa, absorbing the Italian sensibilities and recording those experiences is the unique value of this vacation retreat. Dining on gourmet, Tuscan meals on the terrace under the stars or in the formal dining room is an additional treat for the senses. Relax and let the aura of life in Tuscany filter into your writing and memories and you too will fall in love with Italy. 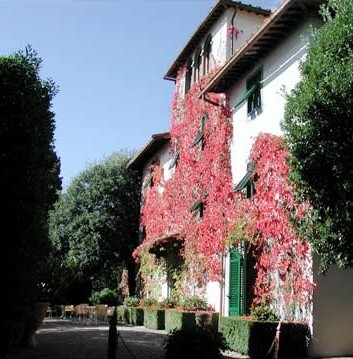 Suggested accommodations are at the Villa Le Barone, Panzano in Chianti, Italy (www.villalebarone.com). Taxi arrangements to and from the Villa from the airport or train station in Florence can be arranged. The Villa provides driving directions. In order to hold rooms for these dates it's best to make your accommodations as soon as possible. You can e-mail or call the Villa www.villalebarone.com . Comfort and Superior rooms are still available. They read and speak English. Contact Barbara Di Palma at info@villalebarone.com for choice of rooms with half board (breakfast and dinner). Who: Ronni Miller, Founder and Director of the Write It Out program, Book Midwife and award winning fiction author is the facilitator. Since creating the Write It Out Program in 1992, she has facilitated this motivational and expressive writing program in universities, colleges, education centers, hospitals, wellness centers and private locations in the United States, Bermuda and Italy. Her guidance has helped individuals cope with cancer and other life altering traumas in health and personal life through writing. Her clients and students as a result of her work have experienced self-confidence, self-esteem and inner strength and happiness. Dr. James W. Pennebaker, Ph.D, known internationally for his research work in expressive writing for healing has endorsed her work in the field as well as her book Cocoon To Butterfly - A Metamorphosis of Personal Growth Through Expressive Writing Her specialty as Book Midwife is in memoir and fiction books. She has a BA degree in English from Boston University, did graduate work at Bread Loaf School of English at Middlebury College, and has studied fiction with Arturo Vivante, Francine Prose, and James Magnuson. She has published numerous articles, short stories, poems, and seven books, and her children’s plays have been produced by schools. She has experiences as newspaper and magazine editor, copywriter, journalist and public relations director and is a student of Jungian psychology. She brings her experiences, education, interests and sensitivity to her client and students. She has said, "I was welcomed to Italy with open arms by a stranger, and that has made all the difference in my life. My love affair with the country and its people began many decades ago and gave birth to a body of my fiction that is set in Tuscany and Venice. Some of the scenes are set at Villa Le Barone as well as another Tuscan villa where Write It Out workshops were held for over ten years. Italy continues to provide me with rich sources of light, love and writing. I have facilitated workshops in Italy since 1997". Texts connected to the Program: Dance With The Elephants-Free Your Creativity and Write, and Cocoon to Butterfly - A Metamorphosis of Personal Growth Through Expressive Writing , both published by Robi Jode Press. TUITION: Tuition of $950 includes retreat workshop, private sessions and salons. Accommodations, food, transportation and sightseeing is not included. Tuition is due with registration. Be sure to book your accommodations with the Villa Le Barone, www.villalebarone.com and mention that you are a part of the Write It Out group. REGISTRATION: Include a short bio, reasons to attend the retreat and writing experience. Payment by check made out to Write It Out and mailed to Write It Out, P.O. Box 704 Sarasota, FL 34230. Questions? Contact RMillerWIO@gmail.com or 941-359-3824. Home Blog Workshops Writing Retreats Books Contact Us!